In 1845, a disaster struck Ireland. Overnight, a mysterious blight attacked the potato crops, turning the potatoes black and destroying the only real food of nearly six million people. Over the next five years, the blight attacked again and again. These years are known today as the Great Irish Famine, a time when one million people died from starvation and disease and two million more fled their homeland. 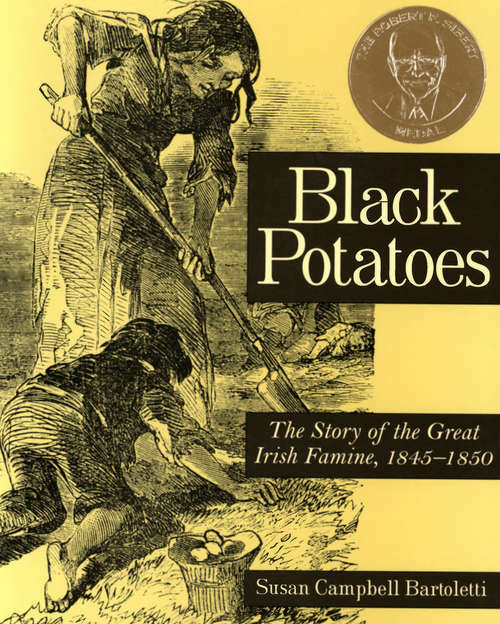 Black Potatoes is the compelling story of men, women, and children who defied landlords and searched empty fields for scraps of harvested vegetables and edible weeds to eat, who walked several miles each day to hard-labor jobs for meager wages and to reach soup kitchens, and who committed crimes just to be sent to jail, where they were assured of a meal. It's the story of children and adults who suffered from starvation, disease, and the loss of family and friends, as well as those who died. Illustrated with black and white engravings, it's also the story of the heroes among the Irish people and how they held on to hope.